Burns with plain wax. Even candle stubs and leftovers are suitable. Made from stone-grey Granicium®: Shaped by hand, frost-resistant and as strong as granite. Romantic candlelight – yet intense and windproof. Intense flames – even with leftover candle stubs. Granicium®, handmade in Germany. For outdoor use all year round. Why only enjoy the fascinating flames inside? 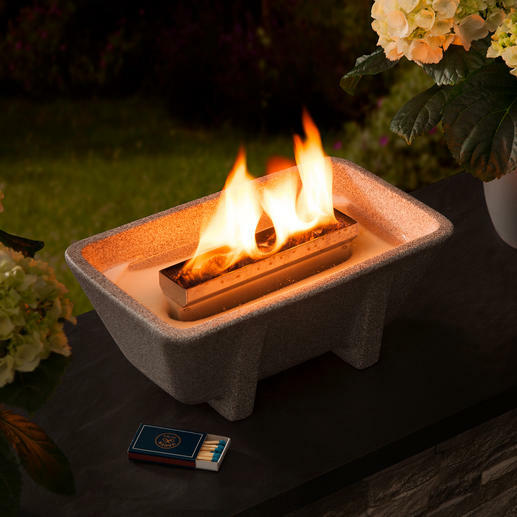 With the impressive Schmelzfeuer® you can also quickly transform your terrace, garden or patio into a cosy retreat. Beautiful on the ground, on a table, on a wall or staircase. Also an original alternative to an open fire. You can do without a warming wood fire when it’s warmer – but still conjure up a delightful light. The wax in the Schmelzfeuer® is sufficient for approx. 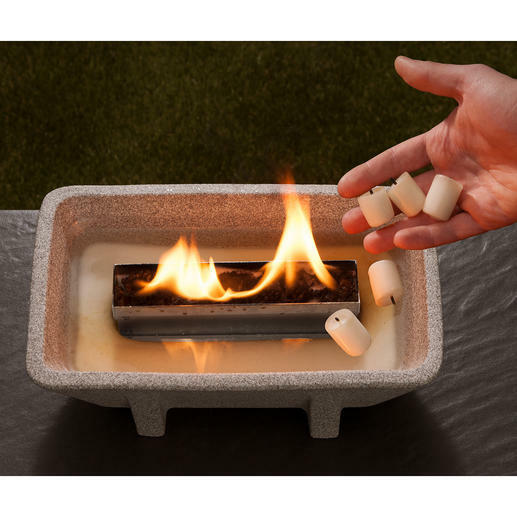 14 hours of wind-resistant burning time (2kg (4.4 lbs) of refill wax pellets available separately). 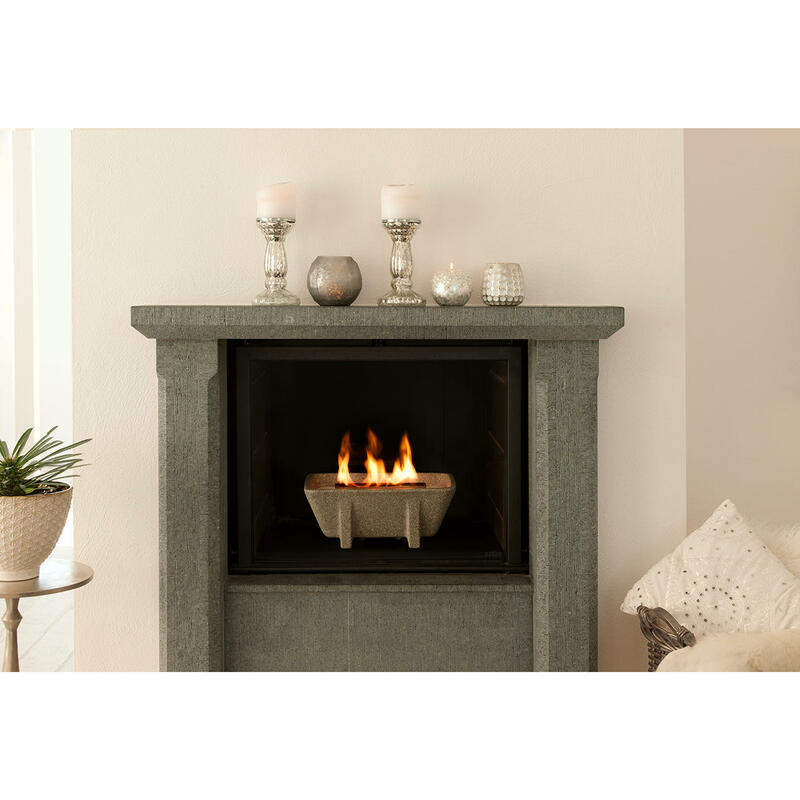 The pellets melt when the flame heats up the aluminium burner (length approx. 17cm (6.7")). In contrast to cotton candle wicks the integrated glass fibre wick never burns down. This way, it can permanently nourish the flames with the wax. If candles are used as fuel, do not remove any wicks, because they sink to the bottom in the liquid wax. A few drops of natural oil (sold separately) provide a pleasant scent or drive away annoying insects. As early as 2011, the tried and tested material made of real granite won the coveted “Materialica Design + Technology Award”. Delivery includes a stainless steel cover plate for extinguishing the flame and for protection against rain, snow and insects. Size (L x W x H) 28.5 x 11 x 16.5cm (11.2" x 4.3" x 6.5"). Weight, incl. filling approx. 3.7kg (8.2 lbs). Made in Germany.